The results are combined to determine the stage of cancer for each person. 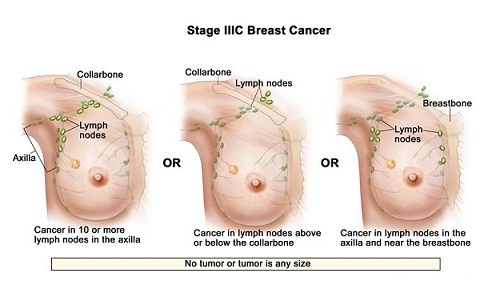 There are five stages: stage 0 (zero), which is non-invasive ductal carcinoma in situ (DCIS), and stages I through IV (one through four), that are used for invasive breast cancer. Stage 0 is also called as non-invasive cancer. 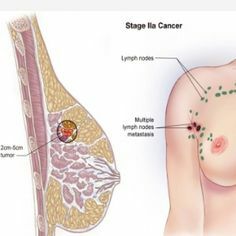 This stage describes, cancer has not spread to the surrounding tissue of the breast. It is situated only in the ducts and lobules of the breast tissue. (Tis, N0, M0). In this stage, cancer is invasive, but localized and it is highly treatable. Stage 1 is divided into 1A and 1B forms. In stage 1A, the cancer is smaller than 2 centimeters. It has not spread to the surrounding lymph nodes. (T1, N0, M0). In this type cancer spreads only to the lymph nodes, and it is larger than 0.2 mm but less than 2 mm in size. There is either no evidence of a tumor in the breast or the tumor in the breast is 20 mm or smaller (T0 or T1, N1mic, M0). Both stages 0 and 1 are highly treatable. In this stage cancer is invasive. This stage is divided into two types…. The tumor is not found in the breast, but the cancer has spread upto the axillary lymph nodes but not too distant parts of the body. (T0, N1, M0). The size of the tumor is 20 mm or smaller and it has spread to the axillary lymph nodes (T1, N1, M0). The size of the tumor is larger than 20 mm but not larger than 50 mm and has not spread to the axillary lymph nodes (T2, N0, M0). Here in this type you may require stronger treatment than the earlier stages. Still you find prognosis is good. In this type, the tumor is larger than 20 mm but not larger than 50 mm and it is spread to 1-3 axillary lymph nodes (T2, N1, M0). Sometimes, the tumor is larger than 50 mm but has not spread to the axillary lymph nodes (T3, N0, M0). In this stage, cancer considered invasive and advanced, if it reaches upto stage 3. It is not spreaded to your organs. This stage is divided into substeps…. In stage 3A the cancer of any size has spread to 4 to 9 axillary lymph nodes, but it is not to other parts of the body (T0, T1, T2 or T3, N2, M0). 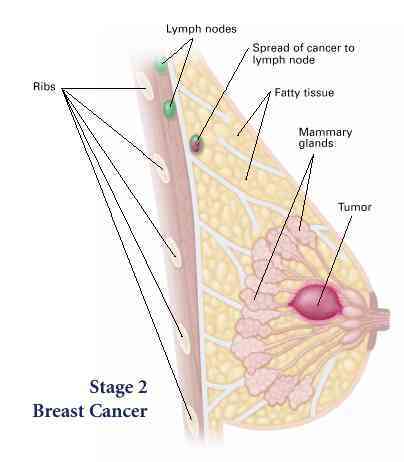 Stage 3A may also be a tumor larger than 50 mm that has spread to 1-3 lymph nodes (T3, N1, M0). In this type, the tumor has been spread to the chest wall or caused swelling or ulceration of the breast or it is diagnosed as inflammatory breast cancer. It may or may not be spread to the lymph nodes under the arm, but it has not spread to other parts of the body (T4; N0, N1 or N2; M0). In this type, tumor of any size which has not spread to distant parts of the body but has spread to 10 or more axillary lymph nodes or the lymph nodes in the N3 group (any T, N3, M0). The lymph nodes affected might be near your collarbone, underarm, or breastbone. The tumor could be any size and has spread to other organs, such as the bones, lungs, brain, liver, distant lymph nodes, or chest wall (any T, any N, M1). When the cancer has first diagnosed occurs about 5% to 6% of the time, that situation we can be identified as metastatic cancer spread. This might be called de novo metastatic breast cancer. Most commonly, metastatic breast cancer is to be found after a previous diagnosis of early breast cancer. Recurrent cancer, which the cancer come back after treatment and it could be either local or distant or both. It can be called relapse of cancer.